Well it has been a crazy summer for me, first trying to update Engined to make it compatible with Divi 2.4 as I had promised, and then we also had the Divi 2.5 update. But anyway, Engined 2.0 is finally here. I´ve tried to release the new version of Engined on several occasions but it really gave me a hard time. Every time I finished a section and checked everything, there was something new in Divi 2.4.x that screwed up something else that was working alright before with Divi 2.4.(x-1). It´s been a crazy mess with all those Divi updates. I even had to finally remove some settings because there was no way to make them work with the last Divi updates, and the worst part of it is that they were working with the previous 2.4.x versions and that some of them are not covered by Divi out-of-the-box. And then, when I had the new update finished by the middle of August, I knew about the Divi 2.5 update, so I had to hold the release once again and wait to make it compatible with Divi 2.5. There´s nothing new or fancy about Engined 2.0 apart from its Divi 2.4 + Divi 2.5 compatibility. In fact, I even had to remove some of the original features of Engined. But I wanted to bump the version number up to 2.0 nevertheless. In the first place because a lot of things needed to be changed under the hood, so the new version is quite different from the previous one. Also, I thought I´d better changed the version number to 2.0 because I think I should still offer the previous Engined 1 as a legacy version (to be used with the Divi 2.3 legacy version), leaving at the same time some room for Engined 1.X updates if needed. The functionality provided by the Magic Codes for the Blog modules can now be handled by the Offset setting in the Divi Blog module. The much needed option for the CTAs links to open in a new browser tab (that was provided via the cta_outbound_link Magic Code) was finally added by ET to the CTA module in Divi 2.4. So Magic Codes may come back at any time if they are needed for future features, but for the time being they´ve been removed from this version of Engined. I´d originally included the Section with Custom Rows custom selectors and settings in Engined because Divi was missing something that was quite important in my opinion: rows couldn´t be customized in Divi versions prior to 2.4, they didn´t even have settings for it! But after Divi 2.4 you´ll find interesting settings to customize your rows. The functionalities and responsiveness provided by the new Divi 2.4 structure for sections and rows are far superior to anything you might accomplish with the Section with Custom Rows feature avilable in the first versions of Engined. Due to incompatibility issues with Divi 2.4, some Customizer settings have being removed from Engined, most of them in the Main Header and in Main Sidebars or Custom Sidebars sections. You may need to check the changelog if you are going to update a site you´ve previously customized with Engined. For example, the settings Hide header on homepage load or Hide header on page load for all pages are no longer available in Engined. If you´ve used these options they will not wor for you in Engined 2.0, so you´ll need to set the HIDE NAVIGATION UNTIL SCROLL Divi option in the Customizer, under Header & navigation > Header Format. Another example is the Sidebar width setting, along with other related settings such as Sidebar-Content Separation, Sidebar end side horizontal padding or Widgets content side margin, which didn´t work alright due to the new way Divi handles the sidebar width in percentages instead of pixels and other Divi CSS changes. So if you want to customize your sidebar width now, you need to use the USE CUSTOM SIDEBAR WIDTH Divi option in the Customizer, under General Settings > Layout Settings, but you will also find some new settings available in Engined 2.0 to customize your sidebar, such as Sidebar-Content spacing (%) or Sidebar inner width (%), among others. After the Divi 2.4 update, some settings are now repeated in Divi and Engined (why, ET seemed to have read my mind in some cases!). Here´s an example: Since its 2.4 version Divi lets you set the color and opacity of the Footer Bottom (or Bottom Bar as they´ve named it on the Customizer). As you probably know, this setting already existed in Engined, so there are now two different places where you can customize your Footer Bottom background. You might wonder why I don´t just simply remove from Engined every setting that is now available in Divi. There are a couple of reasons for it. The first one is to provide compatibility: if for instance you´ve used Engined to customize a site and you´ve modified your Footer Bottom, I want your site to work as you expected and I don´t want to make you go to the new Divi settings and start customizing the same things again. Another reason is that some of the repeated settings in Engined belong to a group of settings some of which are not available in Divi, so it makes sense to have them all in the same place under a particular Engined customizer section, even when there´s an equivalent setting in Divi. In general, Engined settings will take precedence over the Divi settings available in the Customizer. This is the way it works: If you set any Engined setting value out of the default value, the equivalent Divi setting will not work at all, and you´ll only be able to style the corresponding element via the Engined setting. However, if you leave the default value set in the Engined control, the equivalent Divi setting will work instead. In the Footer Bottom background example I used above the default value is #000000 (black) with a 0.32 opacity, both in Divi and in Engined. So if you leave that value untouched in the Engined Footer Bottom background color and Footer Bottom background opacity controls (Engined General Settings > Footer Bottom section), you´ll be able to modify the background using the Divi setting (in Footer > Bottom Bar section). But if you move the Engined settings out of their default values and save your changes, they will take precedence and the equivalent Divi controls will not work. Be careful because sometimes the Divi preview code can play tricks. For example, if you´ve customized the Main Footer background color with Engined (making it different from the default #222222 dark grey color) and then you try to modify the footer background color again but this time from the Divi setting (in Footer > Layout), your´re going to see the background color changing in the Customizer preview, but the color will revert back to the one set in the Engined control as soon as you leave the Customizer. So, this is a general rule for settings that exist both in Divi and in Engined: If you want a default Divi setting to work, leave the equivalent Engined setting with its default value (or set it back to it if you´d already modified it). As I mentioned before, I´m still offering the previous Engined 1 as a legacy version (to be used with the Divi 2.3 legacy version). If you want a copy of it, go to the Engined Legacy version page. If you want to use the new Engined 2.0 with the current version of Divi, you can download it here. Deactivate Engined by switching your active theme (for example to the parent Divi). Delete your old version of Engined. Download the latest version of Engined. Install the new version of Engined in your site. Once you activate Engined, you´ll notice your previous settings will still be there for you. This may not be Engined but I need to get the logo into the nav banner and the slides taller again and the spacing around things correct. I’ll poke around and try to do it myself. I’m mostly writing to thank you. But if you have any quick/easy input that would also be awesome. I won’t move this to live until I get the new version matching the old one. Andrew, I might be wrong and i’m sure Luis will correct me if I am but Engined is a child theme not a plugin so you would need to install it through the appearance setting rather than the plugins. No wonder you´re having trouble: Engined is a child theme, not a plugin. You should install it as a theme. Maybe you´re used to Divi Children (which is a plugin to create child themes) and that´s why you got confused. Please follow the Engined installation instructions and let me know if you have any problem. Pretty brave of you putting out a Divi child. As you said “It´s been a crazy mess with all those Divi updates.” – even just trying to keep our OWN child themes working is a chore I despise. ET is awfully innovative, and very more helpful in the forums than any company I can think of, but seriously, the whole idea behind a child theme is so you don’t have to fix things every time the main theme updates, and Divi hasn’t worked out that way. How can I change the copyright text in Engined 2.0? Easy one, Frank: Open the Customizer and go to Engined General Settings > Footer Credits. Thanks for your wonderful child theme! I just went fro 2.3 to 2.5 (divi) and figuring out how to get my website back to normal ;-). I changed the footer back to © 2015 Tanja Ortmans, but there is an | after that. Do you know how I can remove that? And maybe, do you know how I can get my menu (main and sub) back in line? It’s a complete mess. Can I use the customizer to do that as well? I already deactivated ALL plugins and that did NOT fix it. Nor did switching from Engined to Divi. Any thoughts most welcomed. Thanks. Engined does not interfere with the map module at all, so Engined should not have anything to do with it (proof of it is that your issue persists even when you switch your theme). I can´t know what´s going on with that site, but the et_pb_map class is missing a lot of things there should be inside it, like a div with the gm-style class and several other divs inside that one. Thanks. I figured. But I was desperate for some help. ET has responded and has my login now. Fingers crossed. Hey Luis, your work looks very promising, however, im using Firefox and the avatars are out of place, they overlap the comments. Does that have anyting to do with your child theme? Thanks for the info; I´ll see what´s going on. It shouldn´t have anything to do with the child theme, though. Unfortunately, I can’t find the option so set sidebar width. In the Customizer, go to General Settings > Layout Settings, click on the USE CUSTOM SIDEBAR WIDTH checkbox and the SIDEBAR WIDTH slider control will appear. However, nothing changes when I pay around with the bar… the sidebar on my blog remains the same..
could maybe have a look at it? That setting is for the Main Sidebar, but what you´ve got on that page is a Sidebar Divi module. Is there any chance to change it as well? How do I change the footer credit? i am not sure if this is engined related. im using 2.4.6 and the engined 2.0.0. it been taking me for days deleting extra spaces that is generated whenever i edit the text module then underneath is the blurb module. so when i view and scroll the page, there are extra spaces on top of the text module then a lot of extra spaces after the text module before the blurb. many thanks for the plugin & theme,too. I am having a problem. So before going to ET thought of contacting you. If you could help, that would be great. 1. for more than a year I am using Divi4u plugin to create child theme. Then when engined came, i uninstalled divi4u & then installed engined. 2. Later on divi 2.5 came & I updated it & uninstalled engined,too. this i had to do 2-3 times. Because I forgot which thing has affected my site. 3. Now the things are bit messed up. I cannot edit many settings. And if I change paragraph or anything like if I give bullets, the whole things are jammed into 1 big paragraph. 4. Also, I tried to put Customised css row section & edit the width or color – but it is not responding at all. No changes. I know you are busy, but is it possible for you to guide me in any direction? Foolishly, I did this on my moneysite. Luckily it is my own site. its kinda weird, i just use my mouse in editing my pages plus deleting those extra spaces and when i view the page, it is already ok and alright. there are no more extra space. i find it weird though. i am using a laptop and i can work even without a mouse. i just thought of using the mouse in editing the pages and it work hehehe. Hello. I’ve been using the Divi 2.5.3 for a few weeks and love my new look. But now along comes the update to 2.5.5 and my animation quits working. I’ve figured out (in hindsight) that I needed a child theme, which I attempted to do but failed. Will installing Engine work for me? In the meantime I’ve gone back to 2.5.3 for optimum function. Why is there nowhere in Engined 2.0 to change the background image of the header. Also I turned off the header divider line and shadow and when I turn them back on, they never return. The bugs I’m stumbling on are making me tempted to just return to Divi Child. But thanks for your hard work, it definitely has potential but like a lot of WYSIWYG editors, it leaves some things to be desired. Hey Luis, I don’t know if you remember me from the Divi Group on Facebook but I am having a problem with the 2.0 update. at first I was showing a single line of code that was preventing me from doing some updates so that is why I did update to 2.0 now it seems my whole site has crashed and you can only see weird text. got any solutions? If I switch back to the parent theme everything works fine except all of my CSS is gone. Hello Luis I’m not sure if you remember me from the Divi Group on Facebook but I am having problems with the new Child Engine update. I have updated to 2.5 and was having issues with the Child Engine, I came to this site and saw there was an update. I downloaded the update and now while logged in to my WP dashboard. I see some code at the top and while not logged in I see that none of my CSS is displayed. I’m not sure if the code, will make me vulnerable to attacks so I am not comfortable displaying it here but I would be happy to share it with you privately. 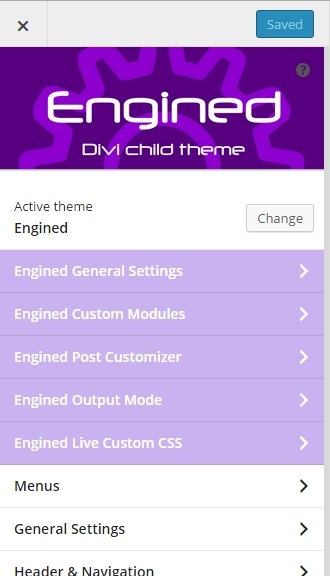 how is the procedure for to install ENGINED child theme on divi? 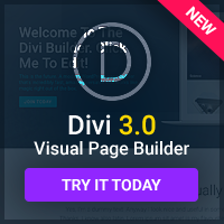 Have uploaded Divi 2.5.9 and Engined 2.0. Btw, I used the plugin “Query Monitor” to see them. Thanks for all your information, Keyra. I just updated a dev site to Divi 2.6 and it’s awesome. I’m using Engined on the site and have already found one (minor) incompatibility. Thought you’d want to know about it. And wondered when you will have an update to Engined to work with it. There may be other issues but the one I’ve noticed is that the overlays on the blog featured images do not work. I currently have Engined disabled which is how I was able to determine that was the issue. I hope that’s all. Thanks for your great work on this child theme. The reason why blog overlays don´t work with the new version is simple: Engined had blog overlays (as well as zoom effects) even before Divi 2.4 existed. Engined uses a modified Divi blog module instead of the Divi native blog module, therefore it does not include any new feature added by ET to that module. Engined provided a lot of new features that were not previously available in Divi. But now ET is little by little including many of those features (for example, text backgrounds for the sliders have just been added in Divi 2.6, whereas they where available in Engined even before Divi 2.4. To tell you the truth, I don´t feel like updating Engined any longer. The reason is that I consider updates as “upgrades”, while in this case they would be something like “downgrades”. That makes sense and is reasonable Luis. Thanks for the quick and informative response. Engined 2.0 is compatible with Divi 2.7? I´m not testing Engined against new Divi versions anymore. Engined was a great child theme that took many months to develop and provided a lot of features not previously available in Divi out of the box. But all the (not backwards compatible) changes ET introduced after Divi 2.4 make it very difficult and tiresome to have it permanently updated to the latest Divi version, because like I said in my reply to Sheila´s comment back in January 26th, I consider updates as “upgrades”, while in this case they would be something like “downgrades”. Engined still offers many features not available in Divi, so you may want to try it. It all depends on what particular Engined and Divi customization features you´re planning to use. But you should do it at your own risk. From your last comment Luis I’m assuming when the new Divi comes out any sites using Engined should not be upgraded unless we’re prepared to rebuild w/o Engined. Correct?! According to ET, any site that is working alright on Divi 2.7.x should work alright on Divi 3.0 too. But, like I said, it´s at your own risk. Just want to confirm I’ve tested Divi 3 this morning on a clone of an Engined site and it didn’t break anything and works perfectly. YAY TEAM! Way to go! Great! Thank you very much, Sheila. I Engined test on a new site with Divi 3.0.7. My client would like the icon of Youtube down and only Youtube. When I’m in the theme customization everything works. I had installed Engined having already worked on my website. I noticed that default active Divi 4 social networks. 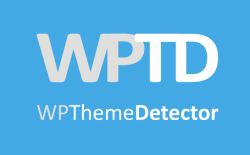 I passed on the theme Divi. I activated the 4 basic networks. I reactivated Engined which recognized the values which I then deleted. Everything is back in order. Thanks, Bruno. I´m glad you figured that out.